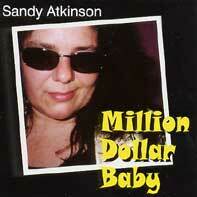 Sandy Atkinson who is based in Tampa Florida, has just released her third album, Million Dollar Baby. The album contains 12 numbers which were all written by Sandy, the songs are performed in an unplugged way. The album starts off with "Baby Please" which is a very strong melodic piece to which Sandy adds her deep rootsy voice to propel it along. Sandy reminds me of Tracy Nelson as they both posses great big bluesy vocal styles. Even though this is a stripped down kind of album, Sandy still has Saxman Wayne Breadwood, who starts off the lovely "Cook In Your Kitchen" which also has good guitar from Tomcat Blake. Rock Bottom plays some haunting harp on "Come Back To The Livin'", whilst Sandy herself contributes some tasty guitar alongside Richard "Hombre" Price. "Please Don't Feed The Alligators" is a short tale about the kind of food that Alligators like, which Sandy does solo. "Red Hot Mama's & Cool DaddyO's" is a lively piano driven sassy tune, thanks to Henry Burke on piano and Wayne Breadwood on sax. "Little Black Dresses" features Richard Price on bass and dobro. "Cajun Man" brings the album to a close and this is my favourite on the album and no it's not a Cajun song, just a good tale about a Cajun man, which Sandy performs to perfection. "Million Dollar Baby" is a complete album with some very well written songs and at times feels as if it is recorded live at an intimate club. This review is copyright © 2002 by Dave Thomas, and Blues On Stage at: www.mnblues.com, all rights reserved. Copy, duplication or download prohibited without written permission.